Last week (February 8, 2018), we witnessed the US Senate spectacle with Rand Paul embarrassing himself with his lack of economic knowledge but also embarrassing both major parties – the Republicans for their gross hypocrisy and the Democrats for their gross idiocy. The – Congressional Record – of Paul’s speech (starting S817) is a classic. Also, last week, the stables were stirring apparently, as the ‘bond vigilantes’ were strapping on their saddles and getting ready to make the US government suffer for its so-called fiscal ‘ill discipline’. These characters apparently emerge out of the darkness of fiscal profligacy to defend our interests and force the government to run surpluses. Fantasy stuff all round. In fact, Rand Paul should resign and get a job he is more suited for (which would be?) and the bond vigilantes should make sure their Shetland ponies are not to wild for them. These bond traders play this elaborate game of bluff and pretend they have the power over the government. In fact, they are mendicants queuing up for their daily dollop of corporate welfare and the government could play them out of the game anytime it chose to. The problem is that the bluff works because governments are captive to the neoliberal nonsense that my professsion preaches. Before addressing the vigilantes, consider the ravings of Rand Paul, which allow us to articulate key Modern Monetary Theory (MMT) principles. The reason I am here tonight is to put people on the spot. I want people to feel uncomfortable. I want them to have to answer people at home who ask: How come you were against President Obama’s deficits, and then how come you are for Republican deficits? Isn’t that the very definition of intellectual dishonesty? If you were against President Obama’s deficits and now you are for the Republican deficits, isn’t that the very definition of hypocrisy? Answer to both questions: YES. That was quick. No discussion is required. Don’t you remember when Republicans howled to high heaven that President Obama was spending us into the gutter, spending us into oblivion? Now the Republicans are doing the same thing. No, they are not. Obama’s stimulus saved jobs as well as lined the pockets of the rich. The current stimulus is just lining the pockets of the rich. Gutter? Which gutter was that? I thought the US economy grew out of the GFC on the back of the stimulus. Oblivion? Which oblivion is that? … we have doubled the amount of money we have spent on the military since 9/11 of 2001 … In fact, do you know what I would do? I would bring them all home from Afghanistan. The war is won. People are talking about having a parade. Declare victory in Afghanistan; bring them home; have a parade; and give them all a raise. Reality check: informed opinion suggests that the Afghan government would fall within weeks and the Taliban would swarm back into power if the troops left. In short, a war that started 16 years ago will continue indefinitely with no victory in sight, because from Washington’s perspective there is simply no viable alternative. To say the “war is won” is as stupid as President Bush’s ridiculous show on the aircraft carrier USS Abraham Lincoln on May 1, 2003, where he delivered his Mission Accomplished Speech. All a bit premature one might say. We had something passed back in 2010 that was called the PAYGO Act … You can only pay as you go. It was sort of like a family would think about it. If you spend some more money, you have to raise your income or you have to save some money. There is no meaningful experience that can be drawn from the finances of the family, which is revenue constrained in its spending and the policy choices available to the US government, which issues its own currency and has no intrinsic financial constraints on its spending. The PAYGO Act was just a voluntary constraint that the politicians imposed on themselves to restrict their capacity to use government capacity to serve the interests of the people at large. These constraints are rarely binding when the top-end-of-town line up for their regular (on-going) dose of corporate welfare. We are in a terrible state, and $20 trillion in debt is bigger than our entire economy. Do you wonder why the stock market is jittery? One of the reasons is that we do not have the capacity to continue to fund the government like this. We have been funding it with phony interest rates that are concocted and given to us by the Federal Reserve, but they aren’t real. The recent share market gyrations have nothing to do with the current fiscal deficit in the US. The Federal Reserve Bank’s policy rate are always “concocted” if by that we mean they are the jurisdiction of the central bank to set as they see fit. Policy settings are always “concocted”. But they are also binding, which makes them a reality. Further, the low rates have nothing to do with ‘funding’ the government. Their chief outcome has been to reduce investment rates for the private domestic sector and reduce the income paid by governments to that sector on outstanding public liabilities (although that statement also involves the other arm of monetary policy – QE). Do you know what happens to the Government when the interest rates go to 5 and they have to borrow for Social Security and Medicare and all the other stuff we have to do? There will be a catastrophe in this country. At least Rand Paul is acknowledging that the US government is responsible for “Social Security and Medicare”. In that light, he should be advocating that the Government fulfills its responsibilities more effectively. And, I recall that the US economy and government ticked along nicely in the past when interest rates (and bond yields) were higher. The shift to catastrophe typically followed attempts by the US government to run continuous fiscal surpluses. Further, higher bond yields mean that income flows to bond holders will rise. They do not indicate a reduced capacity to spend on behalf of the US government. As long as there are real resources for sale in US dollars, the US government will always be able to purchase them – including all idle labour. Instead of just plunking $90 billion down or, actually, printing it over at the Federal Reserve or borrowing it – instead of just doing that — why don’t we take the $90 billion from somewhere in the budget that it shouldn’t be? First, note he admits that the US government does not have to borrow in order to spend “$90 billion” or any sum. He erroneously confuses the Federal Reserve Bank crediting bank accounts on behalf of the US government with some “printing” machine, but we will let that ignorance pass. Second, it might be appropriate to “take the $90 billion from somewhere in the budget that it shouldn’t be” if the US economy is subject to full employment and accelerating inflation and political choices deem it is better to rebuild the flooded houses than use the real resources in the “somewhere” else area of the economy. In that case, expanding the fiscal deficit would not be sensible and would just exacerbate the inflationary pressures. But as a general principle, PAYGO was nonsensical. Instead of nation-building abroad, why don’t we build our country here at home? Why don’t we do some nation- building here at home? Well the short answer is that if the overseas aid is properly allocated, it not only makes peoples’ lives better in places where circumstances are not as favourable as, say, for many in the US, but it also, probably, stops militants hijacking planes and flying them into US towers and/or stealing trucks and driving them down the streets of New York. The money will be added to the debt, and there will be a day of reckoning. What is the day of reckoning? The day of reckoning may well be the collapse of the stock market. The day of reckoning may be the collapse of the dollar. When it comes I can’t tell you exactly, but I can tell you that it has happened repeatedly in history when countries ruin their currency, when countries become profligate spenders, when countries begin to believe that debt does not matter. (a) Wall Street crash 1929 – US government running fiscal surplus in 1929 and 1930 ($0.9 billion in each year) (Historical Statistics of the United States: Colonial Times to 1970 Part 1). (b) Recession of 1937-38 – brought on by the cuts in net spending as the Conservatives attacked Franklin D. Roosevelt’s New Deal policy. (c) Kennedy Slide of 1962 (May 28, 1962) – was an adjustment to a long period of strong growth. Further, the US government hiked taxes and cut spending in 1960 under conservatives pressure to record a fiscal surplus (0.1 per cent of GDP) in 1960. (d) Black Monday (October 19, 1987) – a global crash in share prices precipitated by “program trading, overvaluation, illiquidity and market psychology”. In the US, the Government was reducing the fiscal deficit from 1985 by expenditure cuts. But the crash had nothing much to do with the state of fiscal balances. (e) Friday the 13th mini-crash (October 13, 1989) – Black Friday was precipitated by press reports that the sale of United Airlines had fallen through due to industrial disagreements over the terms. Nothing to do with the fiscal state of affairs. (f) Early 1990s recession (July 1990) – was a global event which followed oil price hikes (after Iraq invasion of Kuwait) and nothing to do with US fiscal balances. (g) Dot-com bubble (March 10, 2000) – overzealousness about technology lead to “excessive speculation”. The Clinton surpluses began in 1998 and continued for the next 4 fiscal years, including the period of the Dot-com collapse. Conclusion: none of these events are associated with rising fiscal deficits or the level of outstanding US government debt. Where fiscal positions are implicated the events occur during or just after the US government has tried to or has been running fiscal surpluses. Rand Paul doesn’t know his history! The hypocrisy hangs in the air and chokes anyone with a sense of decency or intellectual honesty. Which brings me to the bond vigilantes – the bluff bullies. There was an extraordinary report in CNBC US Markets briefing last week (February 9, 2018) – ‘Bond vigilantes’ are saddled up and ready to push rates higher, says economist who coined the term. It seems that Australian financial journalists have been reading the Internet over the weekend. The Australian Financial Review (AFR) report today (February 12, 2018) – Bond market vigilantes smell blood as US budget deficit blows out – attempts to run the same line with some Downunder warnings to boot. These guys should get a real job! In the CNBC report, we read that these “bond vigilantes” are “are no longer under ‘lock and key’ and are free to push yields higher”. The comments are attributed to a “Wall Street veteran” one “Ed Yardeni”, who apparently introduced the term “Bond vigilante” to the nomenclature that financial journalists love to use to make something appear important that is not. The article even came replete with a picture of three wild west types on horses, with guns drawn, presumably attacking some stagecoach or something, with evil intent obvious. Shaking in our boots we are! … the term “bond vigilantes” in the 1980s to refer to investors who sell their holdings in an effort to enforce fiscal discipline. Having fewer buyers drives prices down — and drives yields up — in the fixed-income market. That, in turn, makes it more expensive for the government to borrow and spend. Gosh, where to start with that pot pourri? 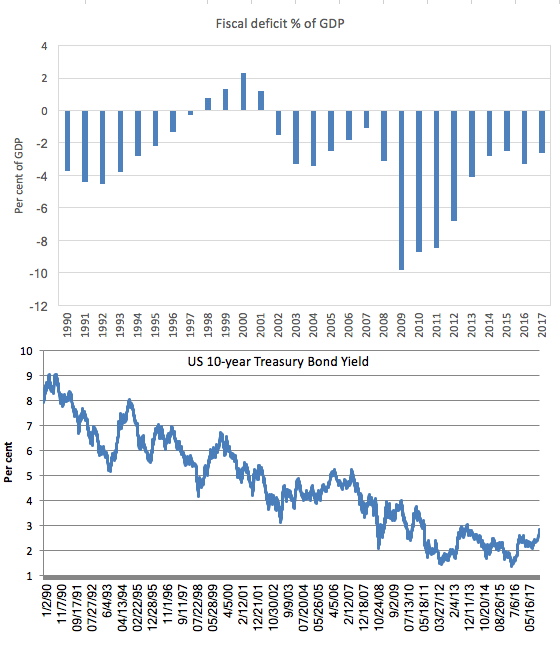 It is obvious that when the demand for a Treasury bond rises, the returns (yields) fall and vice versa. Bond prices and yields are thus inverse. A person who buys a fixed-income bond for $100 with a coupon (return) of 10 per cent will expect $10 per year while they hold the bond. If demand rises for this bond in secondary markets and pushes the price up to say $120, then the fixed coupon (10 per cent on $100 = $10) delivers a lower yield. If the demand for bonds decline (as confidence in other assets rise, for example) then yields will rise. So the income flow on new issues will be larger than before. That has no bearing on the capacity of governments to spend in their own currency. It does not “make it more expensive for the government to … spend”. Now the Fed is slowly raising interest rates and starting to unwind its balance sheet. On top of that, new tax cuts were passed and a massive spending deal was just signed into law. Which means that other interest-bearing assets might become more attractive, which, in turn, means that ‘investors’ shift their portfolio away from Treasury bonds and into these other assets. Of course yields will rise under those circumstances. Nothing. As noted above – only that the income flow on new issues will be larger than before. They’ve saddled up, and they’re riding high. The posse is getting ready. They’re getting the message out. I wouldn’t want to rely on that lot to track down any bandits. A posse has to have intrinsic power. Bond investors only have the capacity to set yields if the government allows them too. Bond vigilantes last made their mark during the Clinton administration, when a bond market sell-off forced President Bill Clinton to tone down his spending agenda. The yield dropped to about 4 per cent by 1998, as the White House and Congress contained spending. The AFR journalist doesn’t add that there was a further large spike in 10-year Treasury bond yields in 1998, and by then the US government was already running surpluses. The following graph shows the US Federal fiscal deficit (as % of GDP) from 1990 to 2017 (top panel) and the daily 10-year Treasury yields from early 1990 to last week. If you can pick a pattern between the size of the deficit and the bond yields then you are better than me. The point is that Clinton was not forced to do anything by the bond markets. He passively allowed them to dictate terms. 1. The private bond markets have no power to stop a currency-issuing government spending. 2. The private bond markets have no power to stop a currency-issuing government running deficits. 3. The private bond markets have no power to set interest rates (yields) if the central bank chooses otherwise. 4. AAA credit ratings are meaningless for a sovereign government – they can never run out of money and can set whatever terms they want if they choose to issue bonds. 4. Sovereign governments always rule over bond markets – full stop. Nothing a student learns in a mainstream macroeconomics course at university (at any level – and the deception becomes worse the in later years as the student enters graduate school) about the relative powers of governments and bond markets is true. First, at any time, the central bank can negate the desires of the private bond markets and set bond yields itself. 1. More fun in Japanese bond markets (February 7, 2017). 2. US Bond Markets cannot bring down Trump (March 9, 2017). 3. Bank of Japan is in charge not the bond markets (November 21, 2016). 4. There is no need to issue public debt (September 3, 2015). 5. Better off studying the mating habits of frogs (September 14, 2011). 6. Who is in charge? (February 8, 2010). A central bank can buy up government debt at its leisure because it can add bank reserves denominated in the currency of issue anytime it chooses and up to whatever amount it chooses – without constraint. So the government can then just set a yield and if bond markets don’t like it then the central bank can buy the debt. Further, the inflationary risk would be unchanged as I explain in this blog post – Building bank reserves is not inflationary. The inflation risk comes from the impact of the net spending on aggregate demand. There is nothing intrinsically inflationary about the government spending without bond issuance. It also clearly takes the bond markets out of the equation and would serve to disabuse us of notions such as the sovereign government has “run out of money”; or will “go bankrupt”; or “will not be able to afford future health care”; and all the related claims that flow from the flawed intuition that initially is advanced and exploited by mainstream macroeconomics. Of-course, this approach would change the conduct of monetary policy – either a zero rate policy such as Japan has run for years or paying a positive return on excess reserves (as many governments have done in the crisis) would be required. The overwhelming conclusion is that far from being dangerous vigilantes, the bond traders are simpering mendicants. We would see that clearly if there was no debt issuance. And what would happen if the government stopped pumping billions of dollars of debt into the corporate welfare market (aka bond market)? Well, then you get a 2001 Australian situation. Basically, the Federal government was running surpluses and not issuing new debt. As a result, the government bond markets became very thin (drying up supply). As a result, the Federal government was pressured by the big financial market institutions (particularly the Sydney Futures Exchange) to continue issuing public debt despite the increasing surpluses. At the time, the contradiction involved in this position was not evident in the debate. We were continually told that the federal government was financially constrained and had to issue debt to “finance” itself. But with surpluses clearly according to this logic the debt-issuance should have stopped. The Treasury bowed to pressure from the large financial institutions and in December 2002, Review to consider “the issues raised by the significant reduction in Commonwealth general government net debt for the viability of the Commonwealth Government Securities (CGS) market”. I made a Submission (written with my friend and sometime co-author Warren Mosler) to that Review. … assisting the pricing and referencing of financial products; facilitating management of financial risk; providing a long-term investment vehicle; assisting the implementation of monetary policy; providing a safe haven in times of financial instability; attracting foreign capital inflow; and promoting Australia as a global financial centre. So a liquid and risk-free government bond market allows speculators to find a safe haven. Which means that the public bonds play a welfare role to the rich speculators. The Sydney Futures Exchange Submission to the 2002 Inquiry considered these functions to be equivalent to public goods. Please read my blog post – Living in the Land of Smoke and Mirrors – aka La-La-Land – for more discussion on this point. So we would watch the banksters (the ‘bond vigilantes’) beg for debt issuance should the US government (or any currency-issuing government) adopt the sensible position and stop issuing debt to match (not fund) its net spending. 1. Currency-issuing governments never have to worry about bond markets (April 3, 2017). 3. Who is in charge? (February 8, 2010). So next time you hear an economist or a politician talk tough about how bond markets have to be satisfied and they use that as a justification for hacking into public spending (and driving up unemployment and poverty rates) you know they are lying and are frauds. The bond traders never have to be satisfied. They can be forced to live on crumbs by the government if it so chooses. I advise the would be vigilantes to get back on their Shetland ponies. Well perhaps even those little animals are a little to wild for the vigilantes. It is unlikely that the share market trading gyration was driven by fiscal ‘concerns’. It followed the release of the Bureau of Labor Statistics data that showed earnings growth was stronger than anticipated. While I show that the ‘market’ misinterpreted the wages data (see No wages breakout in sight in US labour market – the irrational fear of inflation arising from rising unit labour costs triggered the portfolio shifts. The trajectory of the US fiscal deficit has been known for some time. The passing of the tax bill presented no surprise that might have triggered the sell off. Even if wages did rise nicely, as they need to, there would still most likely be no inflation as most people would use the additional income to retire the high level of private debt in the economy. It could even be deflationary as repaying credit money deletes it from the economy in the same way a government surplus deletes money and also imports remove money from the economy. The mainstream will be puzzled indeed when that happens. The stock market ponzi-scheme has been fuelled by years of stock buybacks (price setting feedback loop). 85% of corporate earnings since 1998 have been stock buybacks. The stock market producing ‘funds’ for building stuff in the order of 10^9 (order of billions) (IPO’s+ secondary offerings) every year. And yet it consumes 10^12 (order of trillions) in funds from the real economy private/public sector. So by any measure the model is broken its ~99% inefficient, broken by design. Regarding the charge of hypocrisy in the quote from R Paul at top, since deficits are stimulative, one can discern a political motive for opposing deficits proposed by a president of the opposing party. My sense is that it isn’t “hypocrisy” so much as “deceit”. Each party trots out the “fiscal discipline” fallacy when it suits their political interest, and ignores it when it suits their political interest. I don’t know where I have read it, but I think 80 percent stock bonds are owned by the 1 or 10 percent. Its all secondary market so stocks don’t lead to any business investment anyway. Banks don’t lend for businesses either, they just lend to mortgage home buyers. Is that right? Why does stock market crash lead to problems if stocks are bought with extra money people have? I’d never put my savings in the stock market. If Mr. Paul wants to stop debt from growing, just stop issuing bonds. If Mr. Paul wants to reduce the debt, debit the treasury accounts and credit reserve accounts. If Mr. Paul wants to reduce money in circulation or government debt, just tax people. All of the above involve his 1% fat cat donors and all their lackeys because most people are barely scraping by. Has he asked his bosses if its okay for him to tax their cave money (that they never need) away to make the government numbers look nicer? Haha… Did Yardeni even do his homework? Clinton’s budget moved from deficit to surplus! What I wouldn’t give to see that! hi Bill, I really enjoy your blog and trying to learn about MMT. I’m just curious does your explanation about the bond market then enter in politics because for a central bank to behave per your suggestion and buy any bonds at the price the government sets, it would require the central bank governor to go along with that. Could a government facing a hostile governor/central bank compel them to buy the bonds? You cover yourself by adding “properly allocated”, but this is a strangely naive statement. Several individuals with long careers deeply involved in nation building have blown the whistle on the corruption involved with these activities. John Perkins highlights the high pressure tactics used to force foreign countries to accept U.S. loans/grants, the requirement that those loans/grants be spent on services rendered by U.S. corporations, and the political subservience demanded in return. The poor U.S. reputation in developing countries certainly hasn’t emerged from leaving them alone. Are you saying that terrorism aimed at the U.S. has _nothing_ to do with blowback for countless interventions, both violent and non-violent, in foreign countries? You seem to view terrorist activities through a Marxist lens, suggesting terrorism is sourced only from wealth inequality, and not from repeated military campaigns spawned from political motivations. Since you’re attacking Rand Paul, can you link to a piece where you dismantle Austrian Business Cycle Theory or its variants? I have some fatigue seeing you nail people on failure to understand MMT observations and claiming charlatan. There’s no doubt Rand Paul lacks a proper understanding of sovereign funding, but this is not the primary concern of the Austrian ideology, which focuses more on the heterogeneous nature of capital and the balance of production and consumption through time. Some of your critiques on interest rates and spending are a non-sequitur to an Austrian ideologue, because their faulty view of sovereign funding constraints is an ancillary concern. It might be that Rand Paul is an Austrian Schooler but have you read his speech? It was all conventional macroeconomics that he discussed (insolvency, inflation etc) so that is a sound basis for the critique. I have no interest in critiquing the Austrian school of thought these days as they are marginal to any debate. The blogger Lord Keynes has a comprehensive dismantling of Austrian dogma on his blog including the ABCT. In my opinion the answer is Yes. Very simply- the sovereign government makes the laws that the central bank must comply with, and that government always has ways to change the law if necessary. And if for some reason some especially independent minded central banker didn’t want to comply with the law, well, it is the government that has a police force and an army- not the central banker who would very soon be without a job, or in jail, or worse. Lovely image – bond vigilantes on Shetland ponies. Bill – his speech is just pandering to his corner. He uses buzz words and political rhetoric to attempt to sway opinion. All of your critiques stand if his speech is taken at face value, but I can’t imagine many of the speeches in this context hold up under scrutiny. You take some borderline cheap shots throughout the post that I felt were out of place without addressing his oft-espoused ideology. He was an eye doctor prior to politics btw. Neil – Bob Murphy has addressed much of LK’s criticism. With each retort LK’s arguments have grown more abstract. He tends to care more for zinging commenters on Murphy’s blog rather than producing critiques that stand up to serious review. I hardly consider that debate settled. Isn’t Anarchocapitalism what Austrians espouse? Dude, go home. (Not you DZ, but Austrians). Austrians don’t pass the smell test for me. Did any country (examples: Japan, South Korea, USA, Germany, and China) develop their industry with free market capitalism? Problem with mainstream economics is that its a fantasy land. I can’t help but see Austrians have that even worse. We are marching towards a neo-feudal society and these people want even less intervention. I’m sorry, I can’t take them seriously. Glen Hadden (world’s biggest bond trader) stated at the conference (UMKC) in Sept 2017 words to the effect: When the Fed purchased the toxic assets in QE, the Treasury simultaneously sold long dated securities as a matching sale which neutralized the purchase. If that is the case, should that not have the same effect when the roles are reversed during taper?